Comments: Model 5E2: The Princeton circuit gained a filter choke and a negative feedback loop. Model 5F2-A: The filter choke is removed from the circuit. The speaker jack is located on the bottom of the chassis. 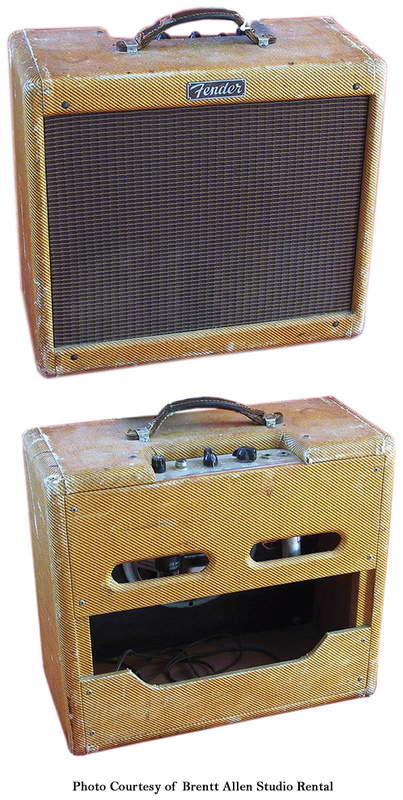 I have a handbuilt clone of this amplifier, where the builder selected each component by hand and built it to exacting specs (with the exception of a 12″ alnico blue in a deluxe size cabinet) and it is more than enough at rehearsals to do the Neil Young, Steve Earle, old school gritty blues rock and country sounds that you would expect from a nice old tweed amplifier. I carry this, an xotic ep booster and a guitar in and I’m ready to go. That’s so funny. I have a 1958 tweed Princeton and all I use is the xotic ep boost. Really gives it the punch it needs. Indeed the clean boost is a great match with the little Tweeds….I like to have a reverb too for cleaner tones. I have an EP-Pre by ClinchFX (mimics old tape delay pre-amp) I love for just a few dB’s. I also have the good old xotic EP Boost. I have been using Andy Fuchs’ Plush reverb pedal after dismissing attempts like VanAmps reverbmate and the Boss FRV-1. My budget doesnt allow the authentic Fender analog unit. I’m building a clone of this amp right now. I’m using an Eminence Rajin’ Cajun’ speaker. Should be a good sounding little unit. All components are top-shelf, Mil-spec. I have a 1960 Princeton and you simply can’t say enough about these things. I had a 1960 Champ which was a lot of fun but the Princeton is a lot more versatile. There is a little mystery though. I cannot find out the impedance spec of the speaker on the 5F2a. The Champ had a 4ohm.